Arcitechture and Interior Design: From Antiquity to the Present provides a survey of architecture, interiors, furniture, and decorative arts from the past to the present. 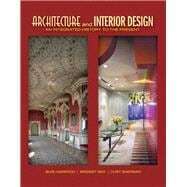 It is a completely integrated and interdisciplinary reference for: architecture, architectural details, architectural surface treatments, space planning, interior design, interior architectural features, interior surface treatments, motifs, furniture, color, lighting, textiles, and decorative accessories. The unique scope allows comparison in all areas of the built environment through the centuries to illustrate historical, social, cultural, and stylistic influences. Narrative and graphics interweave design analysis with architectural and design history. Buie Harwood, FIDEC, Honorary FASID, Certified Interior Designer in Virginia; Professor Emeritus and past Department Chair, Department of Interior Design, School of the Arts, Virginia Commonwealth University (for programs in Richmond and Doha, Qater). Ms. Harwood has held officership and committee responsibilities in the Interior Design Educators Council (IDEC), National Council for Interior Design Qualification (NCIDQ), American Society of Interior Designers (ASID), and Foundation for Interior Design Education Research (FIDER; now called the Council for Interior Design Accreditation/CIDA). Among her many honors, she is an IDEC Fellow, received the first ASID Educator of Distinction Award in 2003, and is listed in Who's Who in Interior Design, the International Directory of Distinguished Leadership, and Who's Who Among America's Teachers. She has received numerous grants, published articles, and implemented research projects related to her historic research and the interior design career path. She is co-author (with B. May and C. Sherman) of Architecture and Interior Design, through the 18th century: An Integrated History, which won the prestigious ASID Education Foundation/Joel Polsky award in 2002, and their second volume, Architecture and Interior Design, from the 19th century: An Integrated History which was published in June 2008. Her book, Decorating Texas: Decorative Painting in the Lone Star State from the 1850s to the 1950s, won awards from the American Association of State and Local History and the San Antonio Conservation Society. She has studied in the Victorian Society Summer Schools at both Rhode Island and England. Bridget May, Ph.D, IDEC, ASID; Professor and former Chair of Interior Design, School of Arts and Sciences, Marymount University. Dr. May has held office and committee responsibilities in the Interior Design Educators Council (IDEC), and been active in the American Society of Interior Designers (ASID). Her many honors include a Benno M. Forman Fellowship for Research in American Material Culture at Winterthur Museum and Library and a one semester sabbatical at Marymount University. She has been listed in Who's Who in Interior Design and Who's Who in American Women. She has had many presentations, publications, and grants related to historic interiors, including one for a furnishings plan for a National Trust Historic Preservation house as well as a 2008 IDEC Special Projects Grant for a design history symposium (with John Turpin). She is co-author (with B. Harwood and C. Sherman) of Architecture and Interior Design, through the 18th century: An Integrated History, which won the prestigious ASID Education Foundation/Joel Polsky award in 2002, and their second volume, Architecture and Interior Design, from the 19th century: An Integrated History which was published in June 2008. She has studied at the Victorian Society Summer School in Rhode Island and at the Winterthur Summer Institute in Delaware. Curt Sherman, FIDEC, ASID; Professor Emeritus, Department of Art and Design, College of Visual and Performing Arts, Winthrop University. Mr. Sherman has held officership/committee responsibilities in the Interior Design Educators Council (IDEC), American Society of Interior Designers (ASID), and Foundation for Interior Design Education Research (FIDER/now called the Council for Interior Design Accreditation/CIDA), and has given numerous ASID and IDEC workshops. Three interior design programs in universities were accredited under his chairmanship. Among his many honors, he is an IDEC Fellow and is listed in Who's Who in Interior Design. He has won prestigious awards for his photography and furniture design, and has had his photography work included in several publications, including books on historic interiors. He is co-author (with B. Harwood and B. May) of Architecture and Interior Design, through the 18th century: An Integrated History, which won the prestigious ASID Education Foundation/Joel Polsky award in 2002, and their second volume, Architecture and Interior Design, from the 19th century: An Integrated History which was published in June 2008. He has also worked on several historic interiors projects and studied at the Attingham Summer School in England as well as programs sponsored by the National Trust for Historic Preservation and the Smithsonian Institute.